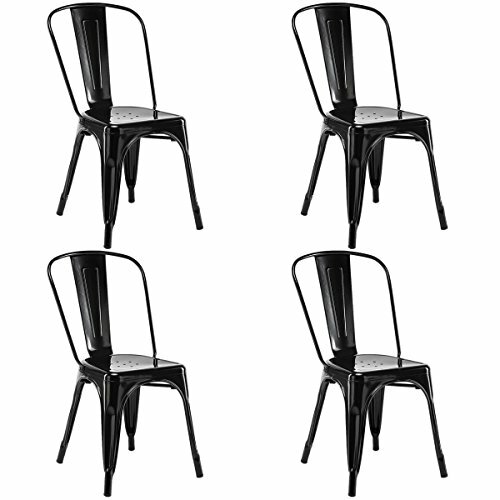 This set of chairs could give you very deep impression with its high quality. It adds a classic touch to your kitchen decor with these durable chairs. Each chair features a high back offers the support needed down the center of your spine to help guard against fatigue and aches. Simple and practical, you can apply it into anywhere you can imagine, such as bistro, living room, dining room and your kitchen. 4 in 1 set at great price. Don't Hesitate To Put Them In Your Cart! Height from ground to seat: 17.3"
【Modern Style】These dining chairs are comfy and stylish with versatile use, which are perfect for your kitchen, restaurant, bistro, coffee house, or anywhere else. 【Stable & Durable】Scratch and mar resistant solid metal with excellent polish finish. Each metal chair has a X-brace under the seat that provides additional support and stability. 【Non-Marking】Each leg has non-marking feet caps that the non-marking rubber feet keep them from sliding and scratching wood floors. 【Comfortable Design】The design of comfortable high backrests ensure you can enjoy your delicious meals and relaxing conversation. 【Easy Storage】Their compact size and stackable design can help you save much space for storage, especially for events, party or commercial use.